1916’s The Chicago Anthology: A Collection of Verse from the Work of Chicago Poets, edited by Charles G. Blanden and Minna Mathison, was one of the first attempts to define and present the poetry of Chicago as a distinctive, unified body of literature. Indeed, plenty of writers have gone on to be defined by their relationship to the city: Carl Sandburg, Karl Shapiro, George Dillon, Edgar Lee Masters, and Gwendolyn Brooks, to name just a few. And this anthology takes up the literary torch with some of America’s brightest poetic lights who’ve been touched by Chicago’s many inspirations. But by no means is the poetic conversation about Chicago over. It’s a vital, important part of the literary landscape of America, and it’s clear that new members are appearing daily. More than a few contributors remarked in their cover letters that the literature of Chicago is experiencing a renaissance. After seeing so many fine new writers and quality veterans, I’m inclined to agree. The poems in this anthology are not just beautiful objects to be enjoyed once and then put away. Savor the ones that seem written specifically for you. Consider the rest a challenge to be met. I guarantee at least three poems in this book will unlock a memory (real or imagined) of State Street vendor brats, the cacophony of smells that is the Taste of Chicago, or the sight of children skating at dusk at Daley Plaza – even if you’ve never been to the Windy City itself yet. Chicago is my hometown. No matter your background or interests, these poems do a fine job of making it yours too. 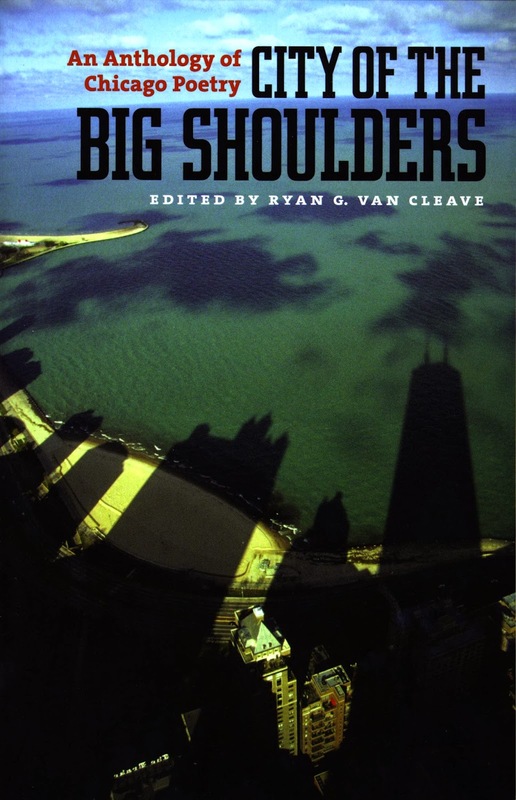 City of the Big Shoulders also provides an interesting counterpoint to the more author-specific anthology The City Visible: Chicago Poetry for the New Century, eds. William Allegrezza and Raymond Bianchi (Chicago Il: Cracked Slab Books, 2007) [see my review of such here]. I admit, I’m more interested in the sake of a geographic anthology to gain a sense of what kinds of writing and writer activity is happening within that arbitrary boundary, rather than an exploration of the personality of that geographic space. Still, I’m fascinated by the exploration of the myth of Chicago, one I’m very little aware of, but for the story of the city as central rail point, or inventor of the Second City comedy troupe, or namesake of that easy-listening shameful 1980s-era pop band. Who are you, really, Chicago? There are remarkably few names in this collection I’m previously aware of – but for Rachel Loden, Tony Trigilio and Don Share – meaning that the bulk of writers from the city working in an entirely different vein, including the more language-centred and more experimental poets are somehow absent from this collection. Contributors to the anthology include Barbra Nightingale, ElisePaschen, Janet Wondra, Vivian Shipley, Maya Quintero, Ellen Wehle, Susan Elbe and some two or three dozen others, each providing their own perspective on the windy city. Perhaps this might be a matter of the style itself in which those more experimental poets work, given that subject was the centre of the collection (or perhaps these writers simply didn’t submit to the original submission call), a call more easily suited to a narrative, metaphor-driven lyric style. This also means that the work within the collection are predominantly, if not entirely exclusively, from the previous decade. It would have been interesting to have seen an anthology that worked archivally, to actually dig through the past half-century or so of Chicago (and further) writing, to see how the city has been already depicted, instead of the fraction of the anthology that appears to have been composed for the call itself. How has the city already been discussed, and by whom? What kind of portrait of the city has already been painted? After years of complaining, I finally have a photo of my great-grandparents, Finley John McLennan (December 1, 1857 – January 12, 1938) and Julia McRae McLennan (June 1, 1862 – July 9, 1932) and their children, taken approximately (according to the back) 1910 (given my grandfather's birthdate and the fact that he looks about seven or so here, my father points out, this is more likely a photo from a couple of years later than that; he also tells me a neighbour has a family image from the same photo studio in Maxville, around the same time). Standing, from left to right, are their children Scott (January 17, 1902 – June 20, 1983), Belle (May 24, 1895 – August 7, 1978), Roddie (May 7, 1889 – October 24, 1955), Christina (December 24, 1892 – March 11, 1923) and Donald (August 1, 1898 – August 17, 1955), along with my grandfather, John Duncan (July 13, 1907 – November 2, 1969) in the front. My cousin Susan (eldest granddaughter of Donald) was good enough to scan and send both sides of the image, from her mother’s collection [see Donald and Jesse’s 1930 wedding photo with Jesse’s 2011 obituary here]. 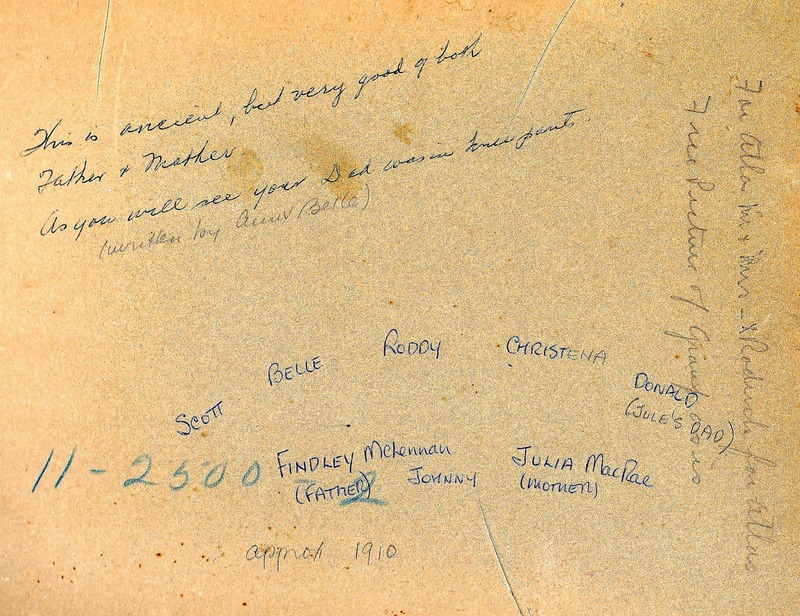 Finley John and Julia had seven children: Roderick, Katherine Finlayson, Christy Ann, Margaret Belle, Donald John, Alexander Scott and John Duncan, as well as an unknown daughter that died in infancy. I’d only ever seen the photo in my father’s copy of Maxville: Its Centennial Story, 1891-1991(1991), a photo presented along with information on our family by one of my father’s older cousins (my father appears to be the youngest of that particular generation). Unfortunately, some of the information this cousin presented was not only twenty-five years out of date, but incorrect (my birth year is wrong, for example). 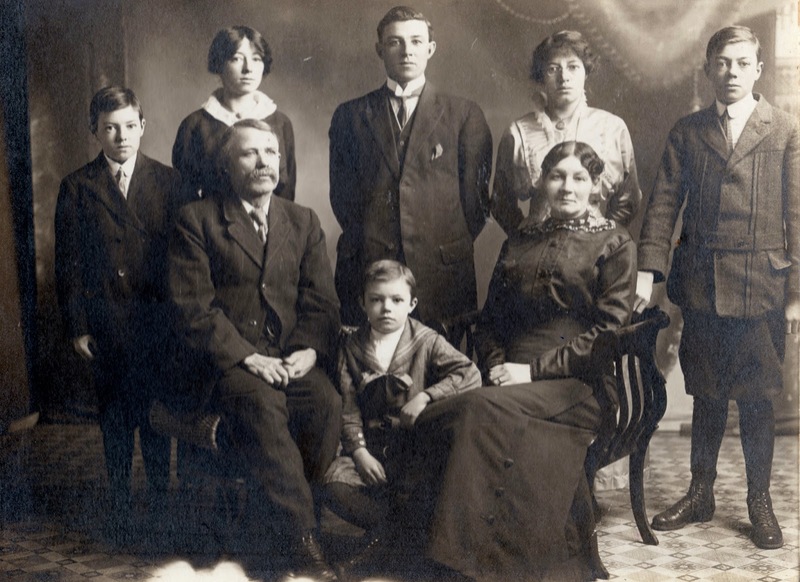 It made me not trust the information on us that had been provided, and triggered my interest in properly pursuing genealogical work. After a decade or more of attempting to get a copy of the photo from this particular cousin, I simply gave up. Finley John and Julia lived next door to where our homestead currently stands, inheriting his uncle Roderick McLennan’s (d. 1873) farm when he died, inherited under the stipulation that Roderick’s widowed mother, Christina McLennan (born in Scotland, she died October 4, 1912 at 81 years), as well as his sister Mary (d. January 29, 1887, at 64 years) would be cared for. The McLennan family Bible, still in my father’s house, was actually a wedding present to Finley John and Julia, who married on February 23, 1888. The house that currently stands on their former property is actually the third (at least) to stand, as the house Roderick would have lived in sat slightly back from the current (you can still see the remains of the foundation), and at least one further (for Christina and Mary) sitting closer to the front of the property. It was actually Roderick McLennan who originally purchased the two hundred acre lot 3, concession 7, Roxborough, from the crown April 10, 1845 (where my father, as well as my sister and I, grew up), only to purchase the one hundred acres next to it, lot 4, concession 7 in 1860 from James McDonnell, the original owner (after Rory’s death, Margaret married Angus MacDonald of Sandringham). Given that he was still listed in the census in 1851 in Lancaster, I’ve long suspected that Roderick never actually lived on the original property, but moved out in 1860 to land that was, instead, already cleared. The farm next door to where my father currently lives was in our family from 1860 until my great uncle Scott finally sold the property (selling parts and parcels off over a stretch of years) in 1955, when he and his wife Janie retired to Ottawa. Since my grandfather was the youngest, he moved across the road from his own homestead after he married (while still working the home farm with his elder brother, Scott), in a log house where my father was born, and where my grandmother not only widowed, but my sister now lives with her husband and three children. At the corner of my sister’s property, apple trees the only evidence of where a one-room schoolhouse once sat, where my great-grandfather and his siblings, as well as some of his children, would have schooled, abandoned around the time my grandfather was born. When my father was less than a year old, he and his parents moved to where my father has remained since. We slowly begin to settle into our new house. Only another six or seven weeks until baby. There are a whole slew of upcoming events at The Factory Reading Series, including the pre-small press book fair reading on October 11, Paige Ackerson-Kiely, Kate Greenstreet and D.J. Dolack on October 21, and a VERSeFest benefit with lectures/talks by David O’Meara, Brecken Hancock and Amanda Earl on November23, as well as the 19th anniversary edition of the ottawa smallpress book fair. I’m also participating in a group reading in early October through the Ottawa Public Library. And Abby Paige has a fantastic newessay, “On the Invention of Language,” posted as the eleventh in the “OnWriting” series over at the ottawa poetry newsletter. Toronto ON: Out of a workshop conducted by Victor Coleman comes the collaborative journal COUGH, the first two issues of which are now available, most likely by contacting one of the editors or Victor Coleman himself. Loosely based on Vancouver’s TADS magazine (as was our own journal, The Peter F. Yacht Club), the journal is edited by a different member of their group each issue, with the first issue, February 2013, edited by Oliver Cusimano, and the second, May 2013, edited by David Peter Clark (a third issue is apparently due out any minute now). Since the Queen Street Quarterly folded, there really hasn’t been much opportunity to see the work of more experimental writers in/around Toronto in journal form, especially from emerging writers (chapbook presses such as Ferno House and The Emergency Response Unit, as well as the Avant-Garden Reading Series, at least, have been picking up some of that slack), so the appearance of such a journal is much-required. A video loops on the ceiling. The first issue has contributions from David Peter Clark, Zach Buck, Victor Coleman, Andrew McEwen, Laine Bourassa, Mat Laporte, Tyler Crick, Oliver Cusimano, Jonathan Pappo, Kelly Semkiw and Robert Anderson, and the second issue has contributions by Louise Bak, Gary Barwin, Michael Boughn, Laine Bourassa, Zach Buck, Jack Clarke, Victor Coleman, Tyler Crick, Oliver Cusimano, Sam Kaufman, Victoria Kuketz, Mat Laporte, Danya Lette, Andrew McEwen, Jimmy McInnes, Jonathan Pappo, Vanessa Runions, Dominique Russell, Kelly Semkiw, Brad Shubat, Dale Smith, Drew Taylor and Jess Taylor. There are some intriguing things here, and a number of writers I haven’t heard of previously, which is always exciting. I look forward to seeing what these folk end up doing next. Cambridge UK: CRITICAL DOCUMENTS editor/publisher Justin Katko was kind enough to recently send a small mound of publications he’s produced over the past few years, including Rosa Van Hensbergen’s SOME NEW GROWTH AT THE TEMPLE OR LOBE (2013), his own Songs for One Occasion (2012), Mahmoud Elbarasi’s ST. BEAUMONT CONSERVATIVE CLUB: TEN POEMS (2012), Posie Rider’s CITY BREAK WEEKEND SONGS (2011), Frances Kruk’s A Discourse on Vegetation & Motion (2008) and Tom Raworth’s LET BABY FALL (2008), among others. It’s nearly too much to go through at once. At this point, Tom Raworth is an old master, publishing dozens of books and chapbooks over the past five decades, and has created a space for himself between language poetry and political commentary that is entirely his own. A former Calgary writer now living in England, I’ve been catching small publications by Frances Kruk for years now, wondering why more of her work hasn’t been available in Canada, or why she hasn’t (at least, that I’ve seen) produced a trade collection? Her small sequence A Discourse on Vegetation & Motion is all anxiety and rage, and it is marvelous.